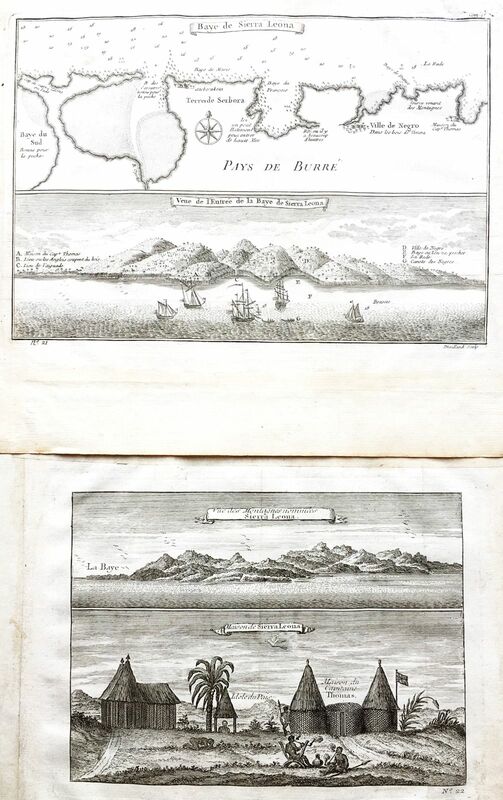 One chart and three views of the coast of Sierra Leone in West Africa on two plates from Prévost d'Exiles' influential collection of travel narratives, Histoire Générale des Voyages. The chart on the upper plate identifies a bay "good for fishing" and a river with "a lot of oysters." The evocative view on the bottom of the second plate shows locals praying before an idol and smoking in front of the house of "Capt. Thomas." Size: 1) 8 3/4" x 6" 2) 7 1/8" x 5 1/4"